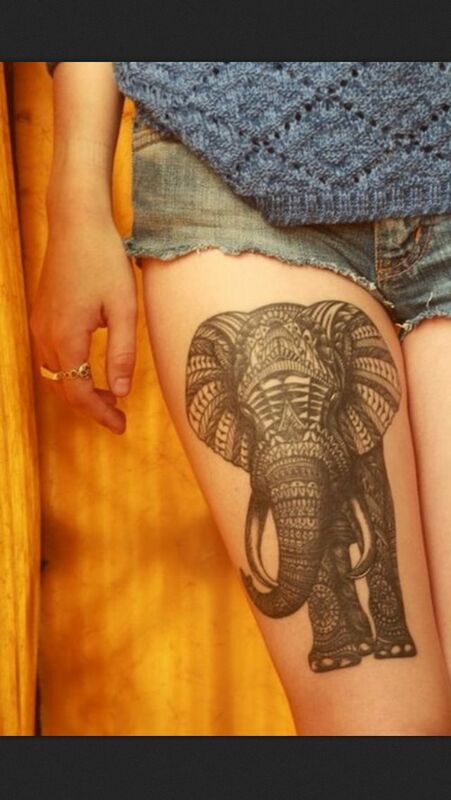 Thigh Tattoos have become a trend these days. Thigh tattoos are smoking hot. Usually, people get tattoos of things or events that are important and special to them and because they want to reminisce about it forever. It reflects a person’s personality, how a person is deep within and what matters to them. It could be about their passion, their thoughts or what they love. 1. MULTICOLOURED FLORAL THIGH TATTOO: Everything that’s floral looks fresh and breezy. A multicoloured floral thigh tattoo can be one of the best adornments for your thighs. 2. Solar lunar Tattoo: Both you thighs deserve love. Why not tattoos for both of them? Bring sun and moon together. 3. ELEPHANT THIGH TATTOO: This tattoo symbolises strength, power, prosperity and luck. A beautiful choice indeed! 4. 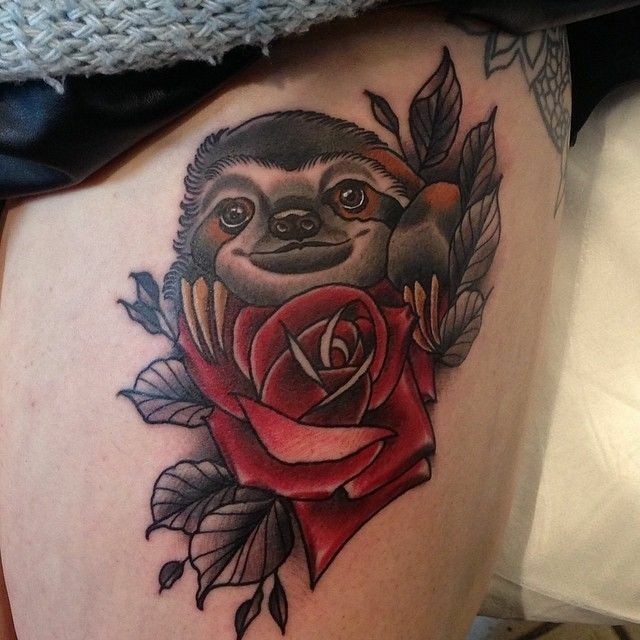 SLOTH TATTOO: So sloth is your spirit animal? Here’s to declaring officially that you’re a lazy person, cheers! 5. 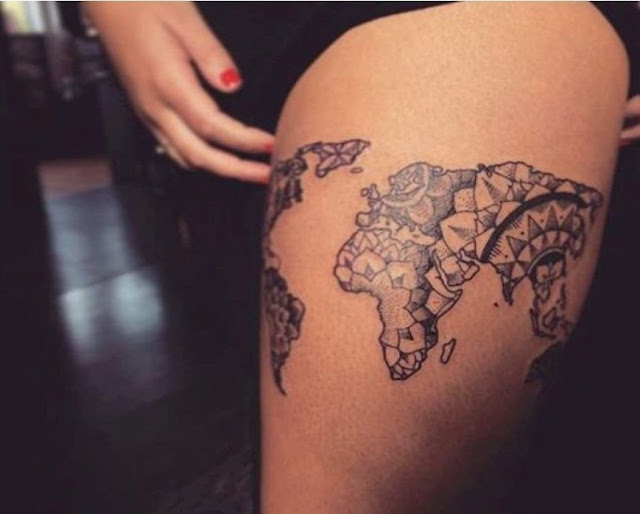 World Map Thigh tattoo: If ‘globetrotter’, ‘wanderlust’ or ‘traveller’ are the words that describe you then this tattoo has to be your ultimate one. Being a passionate traveller this tattoo has to be in your checklist. You should definitely consider it. 6. Eye tattoo on thigh: Let there be a third eye! Where? 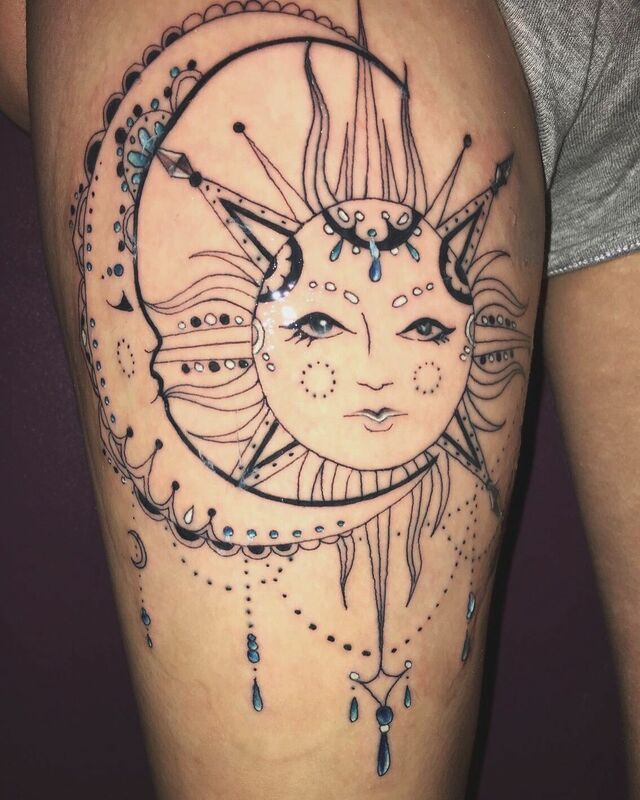 On your thigh! 1. Before you get a tattoo make sure that it’s something significant to you because it will become a part of your body, identity and life. You’ll have to live with it. Tattoos that give you strength and have some purpose are important. 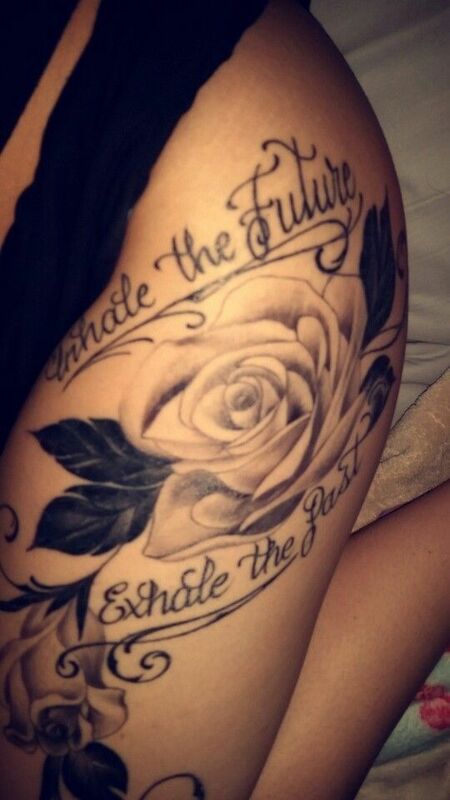 Your tattoo must inspire you, it should be a constant reminder to you about something that’s important. So that you don’t end up regretting it later on. HAPPY TATTOO-ING! 2. Avoid cheap tattoo inks: Get yourself tattooed from a reputed tattoo parlour. Invest carefully. 3. Talk to your artist: Get to know your artist and their style of working so that you get comfortable on the d-day. 4. Someone’s name as a tattoo: getting someone’s name tattooed isn’t a really great idea. You’ll have to stay with the tattoo for the rest of your life. 5. A tube of Bepanthaen+: It’s a cream that prevents rashes after getting the tattoo and is especially for sensitive skin.